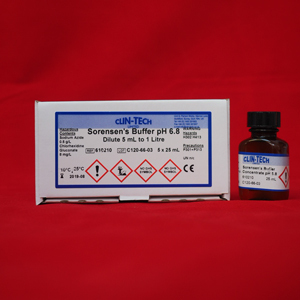 A concentrated version of Sorensen’s buffer, for use as “buffered water” in Romanovsky staining procedures. Dilute 5 mL to 1 Litre water for use. Supplied in concentrated liquid form. Each pack of 5 x 25 mL and will make a total of 25 Litres working solution. Dilute 5mL to 1 Litre for use.